I believe that love that is true and real, creates a respite from death. All cowardice comes from not loving or not loving well, which is the same thing. And then the man who is brave and true looks death squarely in the face, like some rhino-hunters I know or Belmonte, who is truly brave… It is because they make love with sufficient passion, to push death out of their minds… until it returns, as it does, to all men… and then you must make really good love again. Gil Pender (Owen Wilson) is touring Paris with his unsatisfied fiancée Inez (Rachel MacAdams), who just doesn’t share his affection for the beautiful French town. Even though Gil is a successful screenwriter, he wishes to be a writer living in Paris, preferably in the 1920’s if he could have his way. Inez shoots all his ideas down and doesn’t seem to think he could make it as a writer. Her parents share these sentiments and want Gil to continue earning huge amounts of cash so that he and Inez can set up in Malibu after their wedding. Inez and Gil find that Paul (Michael Sheen) and his girlfriend are also touring France. Inez seems very impressed by the pedantic Paul, who just thinks he knows absolutely everything about anything. He offers to read and critique Gil’s novel, and Inez supports the offer, oblivious that Gil would hate it. Inez and Paul decide to go dancing after a wine tasting. Gil, a bit drunk, declines and walks the streets of Paris. As midnight strikes, Paul is picked up by an old fashioned Peugeot car and lands back in the 1920s. He meets a large amount of his literary idols – Zelda and F. Scott Fitzgerald (Tom Hiddleston) and Ernest Hemingway (Corey Stoll). When Hemingway hears that Gil is busy with a novel, he takes him to Gertrude Stein (Kathy Bates), who promises to read it and offer her opinion. Naturally Inez does not believe a word of the story and she leaves before Gil can prove it the following night. Gil takes his novel to Gertrude Stein and meets Pablo Picasso and his beautiful lover, Adriana (Marion Cottliard). Adriana is immediately impressed when she hears the first few lines of his novel, and Gil is very taken with her. Gil spends more time in the 1920’s, irritating Inez and alerting the suspicions of her father Paul (Michael Sheen), who employs a private detective to find out what Gil is up to. Gil is becoming more attracted to Adriana, but when she finds out that he is engaged she distances herself slightly. Adriana leaves Picasso and goes on a trip to Africa with Hemingway, but Gertrude Stein is sure that it will not last. Back in the present, Inez shops for furniture while Gil looks at antiques. He meets Gabrielle (Lea Seydoux), a beautiful French lady who shares his affection for the Lost Generation. Gil stumbles upon a priceless treasure – a diary of Adrienne that mentions him by name. Gil returns to the past where he gives Adriana a gift. They kiss, and a horse-drawn carriage arrives, taking them back to the 1890’s. Adriana expresses her desire to remain there, and Gil is perplexed with her claims that the 1890’s was the golden age, not the 1920’s. They part ways, with Gil returning to 2011. After rewriting the first two chapters, Stein is very much impressed with the progress Gil has made as a writer. She even says that Hemingway liked it, but wonders why the main character does not realise that his fiancé is sleeping with another character, characters that were based on Inez and Paul. Gil realises what this means, and confronts Inez. She admits to the affair but discards its importance, but Gil calls an end to the relationship, telling her that they will be happier apart and that he has chosen to stay in Paris. Inez is furious, but her parents also think that their separation is a wonderful idea. As Gil once more walks the streets of Paris, he meets Gabrielle again, and they take a walk in the rain. 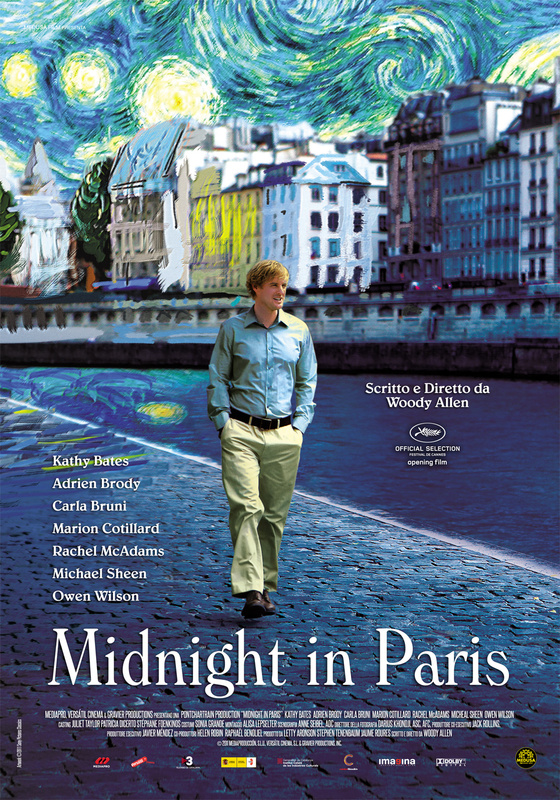 I really enjoyed Midnight in Paris. I had an inkling this movie would be good. I was completely right about it (and who doesn’t love being right?!). Midnight in Paris is beautifully directed and I just fell in love with everything about it. The scenery, the love for Paris (it reignited my desperate need to stand under the Eiffel Tower), the way Paris is portrayed, and the absolutely shockingly amazing performance by Owen Wilson all just contributed to my utter enjoyment of the film. Rachel MacAdams was for the first time ever such a disgusting cow in a role and she obviously has real acting skills to be able to portray Inez and be Ally from the Notebook at the same time. Inez irritated and frustrated me beyond belief and her idiocy of not seeing the worth of Gil while being utterly charmed by the know it all Paul. The questioning of Gil’s sanity is charmingly underplayed and kept me riveted. Was he hallucinating? Was this all going to end in a sad way? I really kept wondering until Adrienne’s journal was found as confirmation, and even then I wasn’t sure of Gil’s mental stability. I absolutely LOVED Owen Wilson in here. He was funny and charming and really looked like a disorganised writer. I think Marion Cottliard is a lovely actress and she was so mysterious in here. I hoped they would end up together but their eventual separation was mutual and beneficial. This was one of those movies where the star studded cast didn’t overwhelm or deduct from the final story being told, and I found a famous face entertaining rather than exhausting when being introduced. Lastly, I really liked that even though there was a love story being told, it wasn’t gooey, and the comedy in the movie wasn’t overwhelming. I am not sure how I would classify this, but I certainly wouldn’t classify it as a rom-com. It is much too intelligent, funny and truly charming to fall into that category, and I actually enjoy rom-coms now and again. I can really see myself watching this again. Recommendation: It is a feel good movie and I would think that most people would enjoy this!